Explore the human condition through the great thinkers in psychology. 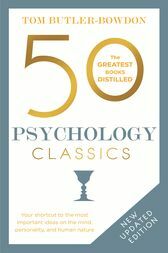 This brand new edition of the bestselling 50 Psychology Classics includes new classics like Thinking, Fast and Slow; Quiet and The Marshmallow Test. Tom Butler-Bowdon is the author of seven books including 50 Politics Classics (2015), 50 Philosophy Classics (2013) and Psychology Classics (2007). Bringing important ideas to a wider audience, the award-winning 50 Classics series has been read by over a million people and is in 23 languages. The 50 Classics concept is based on the idea that every subject or genre will contain at least 50 books that encapsulate its knowledge and wisdom. By creating a list of those landmark or representative titles, then providing commentaries that note the key points and assess the importance of each work, readers learn about valuable books they may not have discovered otherwise. Tom is a graduate of the London School of Economics and the University of Sydney. He lives in Oxford, UK.